Not all teacher certification programs are created equal. 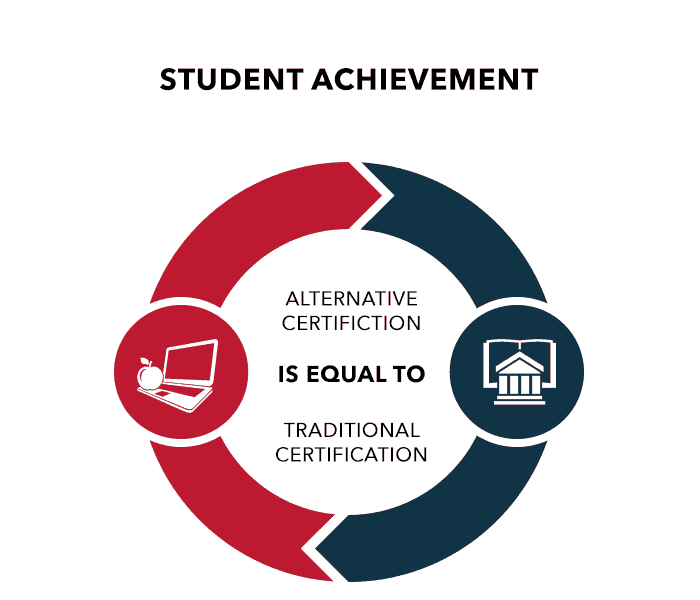 Teachers of Tomorrow has streamlined the certification process over the last 12 years to create a route to the classroom that is affordable, convenient, rigorous, effective, and approved in each state we operate in. Teachers of Tomorrow was founded in 2005, in response to a growing teacher shortage, with the goal of bringing much needed innovation and competition to an industry that did not effectively meet the needs of school districts or potential teachers. Our strategy has enhanced the candidate experience and filled thousands of district openings with quality teachers. Teachers of Tomorrow has completed Phase II of the Council of Accreditation for Education Preparation (CAEP) application, completing the data gathering phase in 2017 and on track for approval in 2018. In 2016 alone, 7,000 teachers were placed into schools by Teachers of Tomorrow. The average age of teachers graduated or enrolled in Teachers of Tomorrow programs is 32. Teachers of Tomorrow is ranked #2 in the nation for diverse recruiting, with 46% of our teachers being non-white. 68% of our teachers are still teaching 5 years after they started. This is well ahead of the national average for teacher retention. Not all ACPs are created equal. Many certification programs have high price tags, arbitrary deadlines, and poor customer service. A comprehensive independent study from the University of Texas of over 200,000 math scores and 300,000 reading scores showed no difference in student achievement between our teachers and teachers from traditional routes. What sets Teachers of Tomorrow apart? Our unique business model presents no cost to the state or district. Candidates make a low upfront payment and pay nothing more until they are hired as the teacher of record. The remaining balance is then paid in monthly installments. Highly trained Program Advisors provide expert guidance throughout the certification process. Veteran educators serve as our Field Supervisors, who conduct in-classroom visits throughout the first year of teaching. Strong district relationships ensure that our teacher candidates are aligned with district hiring needs. Our outreach and recruiting teams serve as direct representatives to each district to effectively manage vacancies. We have created a best-in-class alternative teacher certification program to ensure we meet the needs of career changers who want to come into the teaching profession, our schools who need talent now, and students who want a highly professional, engaging teacher. Our teacher certification program involves the following steps. We attract tens of thousands of diverse teacher certification students each year across the United States, primarily in Florida, Nevada, Texas, and Utah. We actively recruit a candidate pool that more closely matches the demographics of student populations. Candidates must meet minimum requirements to be accepted into our program and become a teacher. Requirements include earning a bachelor’s degree with the minimum GPA for the state as verified by college transcript(s), passing the Teachers of Tomorrow interview, and a clear background check. We provide over 300 hours of comprehensive coursework during our teacher alternative certification program. Our rigorous training process ensures that only well-qualified candidates enter the classroom. The program facilitates the hiring process by aligning district needs with our diverse candidate pool. 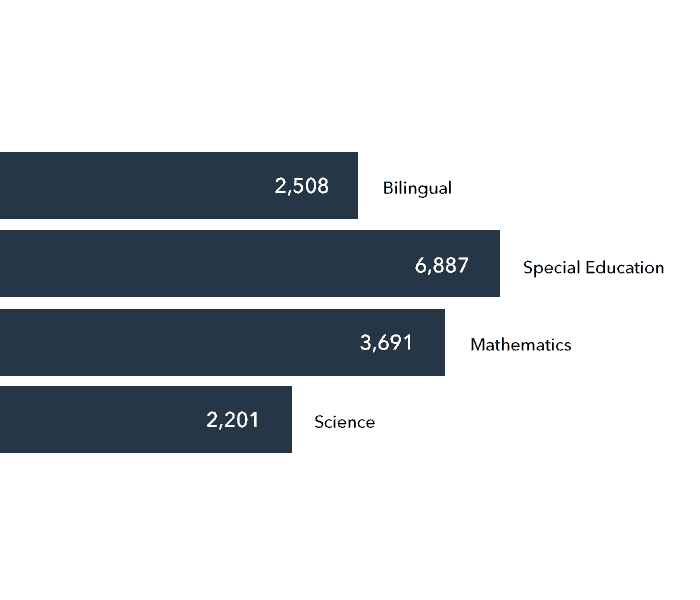 Our candidates are hired in high-need areas including STEM, bilingual, and special education. We provide our partner school districts with lists of qualified candidates. The research is clear that first year teachers need support in order to succeed. Our Field Supervisors work with the teacher’s mentor and school principal to ensure our candidates get the critical support and help they need to be successful in the first year. It is why 68% of our teachers are still teaching after 5 years! We assist in managing candidate completion of all the teaching license requirements for our candidates in each state. It is not easy to get a teaching license – but our expert advisors make sure you get the credentials you need to get a classroom of your own! There will always be a need for teachers, regardless of the economy, budget cuts, and changes in education. Society needs skilled and passionate teachers. We have worked hard so that 42,000 people just like you were able to start teaching. Many have been recognized for their work by being named teacher of the year! a better time to enter the teaching profession.